Z-Select 4000T thermal transfer labels are premium, bright white, ultra-smooth, paper labels with permanent acrylic adhesive. They offer great print quality for printing up to speeds of 12 inches per second. For high quality, durable barcode print results, use Zebra 6000T Wax Ribbon High-performance wax ribbon. Zebra's 6100T High-performance wax/resin ribbon, provides good resistance to scratches, smears and moderate chemicals. 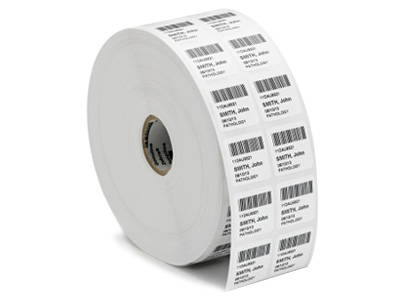 Zebra Z-Select 4000T labels offer excellent quality labels at a great value. With a variety of adhesives and label dimensions to choose from, Zebra Z-Select 4000T label are an effective solution for many labeling projects including: product, shipping, inventory or warehouse labeling. Find it faster! Click here to compare Z-Select 4000T models by feature.